Now that I’m home and rested, I feel ready to try and summarize the last two days of my trip to NAMM in Anaheim, CA. Here we go…..
My first order of business was attempting to capture the hugeness of NAMM by shooting a video while walking from one end to the other. The result, even with stabilization applied, is pretty shaky, but you should get some idea of how huge the show is. And that’s not even the whole thing. There are two more floors, both significantly smaller than the main show floor. The previous day had ended before I got a chance to check out the Voodoo Lab booth, so I headed straight there and got a look at two new pedals that are not yet available, the Sparkle Drive Mod and the Giggity. The Giggity is an interesting pedal that is kind of like a highly optimized EQ pedal for guitar. The designers have identified the frequencies most usable for guitar and built a set of controls around those bands. The controls allow you to fatten up your tone, shape the treble response, and add some boost. One practical use of this pedal would be to compensate for massive differences in tone balance between two guitars, like a Strat and a Les Paul. You could, for example, set the amp up to sound good with the Les Paul, but use the Giggity to bring the Strat up to the same output level, and iron out any frequency adjustments needed to make it sound good with the Les Paul optimized amp settings. Pretty soon it was time for lunch and I had plans to meet up with Robert Renman, creator of fine guitar lessons and gear demos at Dolphinstreet.com. This was a real thrill because we’ve been in email communication for over a year helping each other out. Getting to meet in person was great. Robert has some great ideas for future lessons, and I sincerely hope he’s able to realize all of them. While our audiences have some overlap, I think he can reach guitar players of other styles too, that I never will, and I wish him the best. I met up with Jack Ivers from Agile Partners, the company responsible for the Guitar World Lick of The Day iPad/iPhone App, and more recently, the AmpKit application they developed in collaboration with Peavey. I got a great demo and a chance to try it out myself. I learned two things. The occasional problem with feedback at high gain levels is due to crosstalk on the two way cable that plugs into the headphone jack. This is a problem that also occurs with the iRig sold by IK Multimedia, which I own already. Secondly, Amp Kit sounds way more impressive through proper speakers than it does through the cheap iPhone headphones I’ve been using. The guys from Agile Partners are super cool, and really talented at what they do. 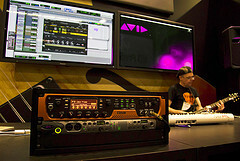 Next up was Avid. I met with Hiro Shimozato, the principle designer of the Eleven Rack. If you haven’t yet heard of the Eleven Rack, you will. One of my customers, with good taste in tone, raves about his Eleven Rack. From the little time I had with it, even through headphones, at NAMM, it sounded good. Really good. I cannot wait to get this thing in my studio and see what it can really do. Graph Tech String Saver Saddles have been a must-have on my guitars, ever since I read about Kenny Wayne Shepherd using them over 10 years ago. Before I started using them, I broke strings on a weekly basis, and the fear of breaking strings during a show was terrifying. I stopped by the Graph Tech booth just to tell them how much I appreciated the String Savers. Before leaving, they taught me about the Tusq material they use to make guitar replacement nuts. Its main advantages are more consistency in the material and tone from string to string, and lubrication, which helps tuning. I will certainly try this out on at least one of my guitars in the future.
! [https://cdn.texasbluesalley.com/news/ModZero_t.jpg)ModZero by Jack Deville Electronics Before NAMM, I had never heard of Jack Deville’s pedals, but Robert from DolphinStreet.com told me about a cool chorus/vibe/flanger pedal they had, so I headed down to their booth. Jack gave me a good demo of the Mod Zero pedal, which seems to do a bit of everything and sounding great at the same time. Unfortunately, it was quite loud while I was there, so I couldn’t hear very clearly and I left hoping that I’ll get a chance to try the pedal myself some day. My last stop of the day was the Jaguar Amplification booth. 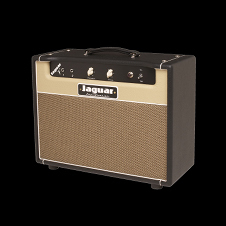 I tried out the Jaguar 7, a small 7 watt combo amp that is switchable to 3.5 watts. Nice and simple, and sounds great too. I believe it sells for under $1k, but don’t quote me on that.